Reverse: .DUCE MAC GREGORIO./ LIBERTAS FLORIDARUM - Cross fourche within laurel wreath, "Green Cross of Florida." Daniel Parish, Jr.; ?ex Bushnell/Chapman sale (1882), 349; ?Clay/Leavitt sale (1871), 347-348. 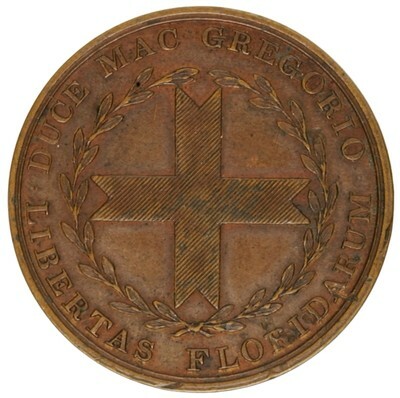 SubjectPlace: Spanish East Florida, Amelia Island occupied by Scots adventurer MacGregor and filibusterers bearing letters of authorization from representatives of Latin American independence leaders.